Picking colors for your next interior or exterior design project is always a fun but challenging task. Many of us turn to recent home magazines or to a retail store for color inspiration. For this task, many of us may even browse paint swatches. It’s a great way to put colors side by side to see how they compliment each other. One thing you’ll notice right away in magazines, stores and paint departments everywhere is dark colors. Colors, as you probably already know run in trends. For example, white cabinetry was hot for a long time, now however it’s not as popular with new builds. Everything associated with a home runs in trends as well. Like the oil robbed bronze and satin nickels fixtures that are so hot right now. Ten years ago it was polished brass and chrome. Dark colors are very popular in design right now. Furniture, flooring, cabinetry and outdoor decorating materials are all leaning toward dark colors that favor cherry, dark brown stained cedar and darker reds such as the Brazilian hardwood Ipe. When composites were originally introduced over 15 years ago, there was little to no color selection. The consumer has now demanded lots of choices so all of the manufacturers have expanded their choices. When they first expanded, there were still 2-3 choices. 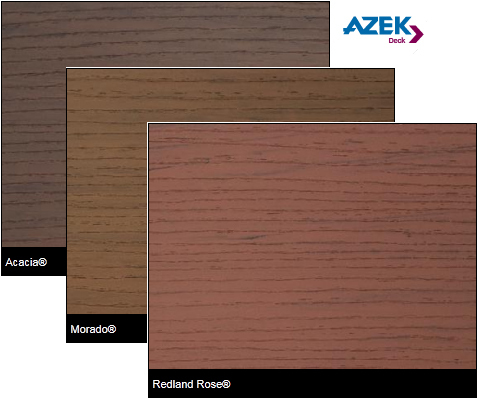 Now it’s not uncommon for manufacturers, particularly AZEK, to have up to 10 choices for colors. The range of choice over the last 10 years has grown exponentially as the manufacturers have tried to meet consumer demands so many of the new selections are in the darker colors. 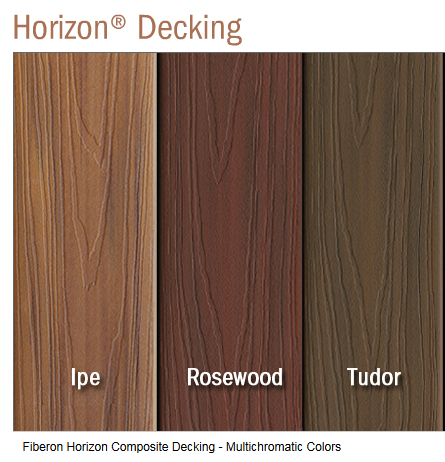 If you are thinking about using composites for your next deck project, you will see that their lines include colors that cover the entire spectrum often having boards as light as white and boards in very dark brown or even black. What our customers are choosing right now are the dark brown and dark red colors. Throughout this post are some of the colors that are currently popular. I’ve also included links to their sites so you can see more colors. 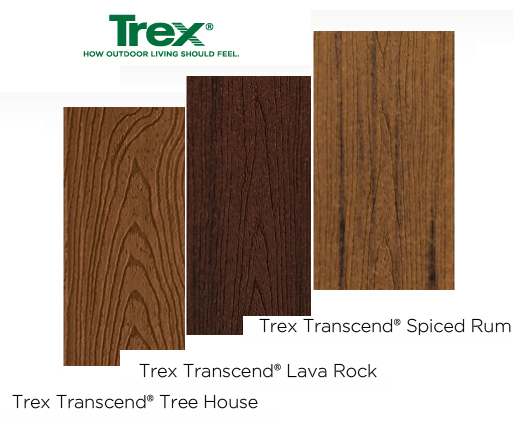 TimberTech Earthwood Evolutions is the newest line from TimberTech. This line combines the strength of composite with the finish strength and benefits of PVC. Pacific Teak and Pacific Rosewood are two of the very appealing dark shades. 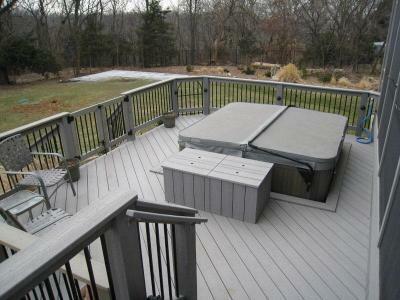 Here in Kansas City, we also use EverGrain Composite decking. 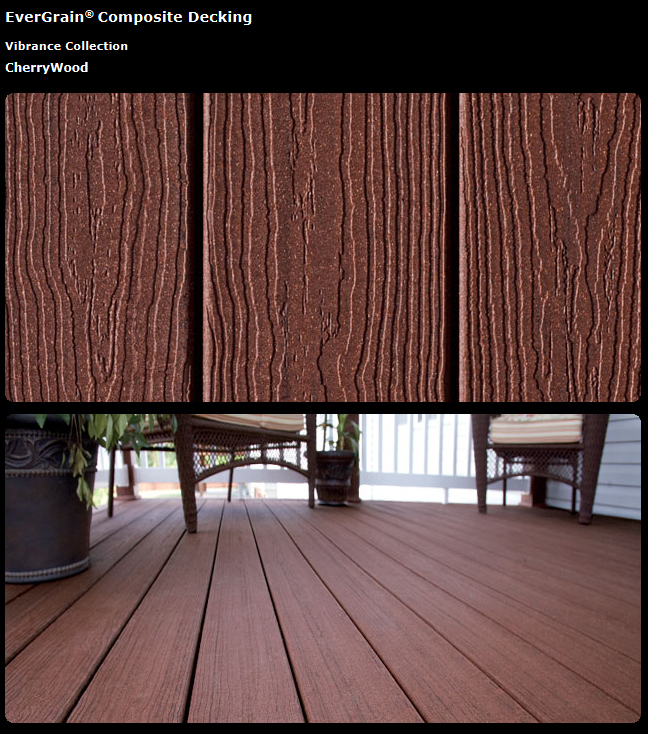 Evergrain has some really nice decking colors.This CherryWood color enjoys a rich reddish look. Whether a dark color is the right choice for your next outdoor project or whether a lighter, more subtle nuanced shade is best, give us a call to discuss design options. Our office number is 913-851-3325. Or, you can email us at kansascity@archadeck.net. 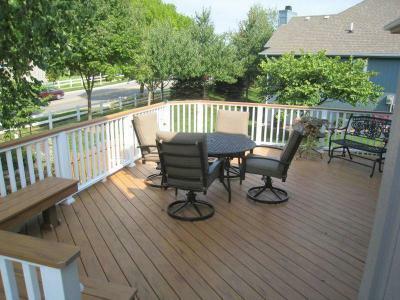 This entry was posted in AZEK, Composite decks, Composite woods, Decks, EverGrain, Fiberon, low maintenance decks, TimberTech, Trex and tagged AZEK Acacia Kansas City, AZEK composite Kansas City, AZEK decks Kansas City, AZEK Kansas City, AZEK Morado Kansas City, AZEK Redland Rose Kansas City, Fiberon Deck Kansas City, Fiberon Horizon Kansas City, Fiberon Ipe Kansas City, Fiberon Rosewood Kansas City, Fiberon Tudor Kansas City, PVC decking Kansas City, TimberTech composite Kansas City, TimberTech Earthwood Evolutions, TimberTech Earthwood Evolutions Kansas City, TimberTech Harvest Bronze Kansas City, TimberTech Kansas City, TimberTech Pacific Rosewood Kansas City, TimberTech Pacific Teak Kansas City, TimberTech XLM Kansas City, Trex composite Kansas City, Trex deck Kansas City, Trex Kansas City, Trex Lava Rock Kansas City, Trex Spiced Rum Kansas City, Trex Tree House Kansas City on June 28, 2011 by archadeckkansascity. 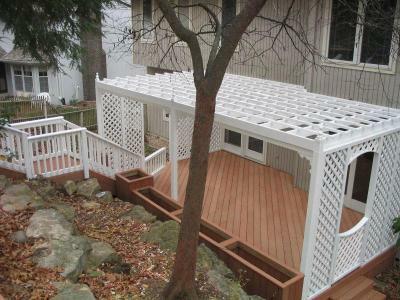 Are you considering building a new deck, patio or other outdoor living area in your back yard? If you’ve talked to friends or done some research, you’re likely very familiar with composite woods or you’ve heard a good deal about them. Likely you’ve formed some sort of opinion and likely feel that composite would be ideal for your new project. Like everything that lasts longer, composite is more expensive. And, for the most part, you get what you pay for. The composite wood industry is almost 20 years old. Some of the composite companies are actually on their 4th or 5th generation of product cycle. They’ve added new colors, new materials, new styles and new features. Previously, the composites were not warrantied against stain and fade. Composites are now just coming on to the market with stain and fade warranties – and long ones too. TimberTech is coming out with a new product called TimberTech Earthwood Evolutions which has a 25-year fade and stain warranty. AZEK and Fiberon are also addressing the fade and stain problems with composites. Warranty is one big difference you will find among composites. But, the other big differences are price and the composite characteristics. Price will vary for market to market based on a variety of factors. But even composites that look somewhat similar can have very different characteristics. One company’s cedar shade may be very different from another. Another company’s grain pattern or texture may be different than another company’s product. So, how do you decide? Everything is a balance. Weight what is important to you as it relates to warranties, required maintenance, price and the aesthetic appeal of the composites you are considering. Then, during the specification and design phase, find an experienced contractor with strong familiarity across many of the composite lines to discuss the pros and cons of the top composites you are considering. A qualified, experienced professional outdoor contractor will be glad to take the time with you to review the choices and considerations when selecting the composite that’s right for you. I’ve been an outdoor builder in the Kansas City market for over 10 years now and used many of the top composites including EverGrain, TimberTech, AZEK, and Fiberon. This entry was posted in AZEK, Composite woods, Decks, EverGrain, low maintenance decks, Low Maintenance Patios, Patios, TimberTech and tagged Archadeck KC, Archadeck of Kansas City, Azek, AZEK decks Kansas City, Deck builder Kansas City, Fiberon, Fiberon composite Kansas City, Kansas City decks, Kansas City patios, KC covered patios, Patio builder KC, TimberTech Earthwood Evolutions on March 22, 2011 by archadeckkansascity.